Kedarnath Weather : Winter: Sep. to Nov. cold during the day and chilly at night. Summer: May - August- Cool during the day and cold at night. Best Season : May to October except monsoon is the best time for Kedarnath yatra. Amidst the dramatic mountainscapes of the majestic Kedarnath range stands one of the twelve 'Jyotirlingas' of Kedar or Lord Shiva. Lying at 3584 mts height Kedranath is one of the 4 important chardhams of India. Kedarnath is a majestic sight, standing in the middle of a wide plateau surrounded by lofty snow covered peaks. The present temple, built in the 8th century by Adi Shankaracharya, stands adjacent to the site of an earlier temple built by the Pandavas. The inner walls of the assembly hall are decorated with figures of various deities and scenes from mythology. Outside the temple door a large statue of the Nandi Bull stands as guard. Dedicated to Lord Shiva, the exquisitely architectured Kedarnath temple is said to be more than a 1000 years old. Built of extremely large, heavy and evenly cut gray slabs of stones, it evokes wonder as to how these heavy slabs were handled in the earlier days. The temple has a " Garbha Griha" for worship and a Mandap apt for assemblies of pilgrims and visitors. A conical rock formation inside the temple is worshipped as Lord Shiva in his Sadashiva form. Kedarnath is situated in the Uttar Kashi district of the northern state of Uttaranchal. Very close to the Indo-Chinese border, it is the source of the Mandakini River. It is couched in the scenic locales of the Garhwal Himalayas at 3583 meters above sea level. It is very cold in the winters with the ground being covered with snow. In the summers, the mercury barely crosses the 20°C mark. The place experiences about 150 cm of rainfall during the monsoons and so the best time to visit is between May and October. Kedarnath is near to Rishikesh (234 km) and Dehradun (250 km). Legend has it that when the Pandavas sought penance following the great war of the Mahabharata they came in search of Lord Shiva. Arriving at this site they found that Shiva had elusively taken the form of a bull. Bhim the strongest of the Pandavas went after Shiva who dived deep into the ground. Only Shiva's tail was left in Bhim's hand. This spot is known as the Kedarnath and is also considered the main Kedar. The rest of Shiva's body emerged at four other places in Garhwal - Tunganath, Madhyamaheshwar, Kalpeshwar and Rudranath. Three of these (barring Kalpeshwar) are in mountain meadows at higher altitudes than Kedarnath. The climb to Rudranath is the most strenuous though worth the trouble, as this meadow is one of the finest in Garhwal. These five Kedars are worshipped as Panch Kedars. Shiva's arms came out at Tungnath. 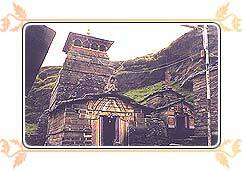 The Tungnath temple is at an altitude of 3,680 m and is the highest Shiva shrine among the Panch Kedars. However it is the easiest to reach from Chopta, the nearest road head. Shiva's face is worshipped at the Rudranath temple. It is about 2,286 m above sea level and is 23 km from Gopeshwar. 5 km of the distance is motorable and 18 km is on foot. The trek passes through wild orchards and picturesque bugyals (meadows) and involves trekking over high ridges (sometimes 4,000 m). The temple site provides magnificent views of Hathi Parvat, Nanda Devi, Nanda Ghungti, Trishuli and many other peaks. There are a number of holy kunds or ponds near the Rudranath temple like Suryakund, Chandrakund, Tarakund. The entire area is utterly enchanting and unmatched in scenic beauty. Anusuya Devi temple is located on the trek to Rudranath involving an additional trek of 3km. The present temple, built in 8th century A.D. by Adi Guru Shankaracharya lies adjacent to the site of an ancient temple built by Pandavas. The walls of the exquisitely architectured temple are embellished with figures of deities and scenes from mythology. The temple has a conical lingam - the main idol, a statue of Nandi - the celestial bull, a 'garbha grab' for worship and a 'mandap' for assemblies of piligrims and visitors. The temple is believed to be more than 1000 years old. 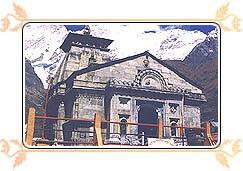 Behind the Kedarnath Temple lies the samadhi or the final resting place of Adi Guru Shankaracharya. It is believed, after establishing the four dhams in India, he went for his samadhi at an early age of 32 years. A small lake from where Yudhishthir, the eldest of the Pandavas, is believed to have departed to heaven. The floating ice on the sparkling waters of the lake is a fascinating sight. A picturesque lake, 4,135 mts. above sea level is encircled by lofty mountains and offers a commanding view of the Chaukhamba peaks. The Gaurikund to Kedarnath trek route is one thing that you should not miss during your trip. A temple dedicated to Gauri and thermal springs of medicinal value are noteworthy. The confluence of Son Ganga and Mandakini rivers. The road to Triyuginarayan diverts from here. A 5 kms. trek from Sonprayag, it is the mythological venue of the marriage of Lord Shiva and Goddess Parvati. An eternal flame, which is said to have been a witness to the marriage, burns in front of the temple even today. The temples of Ardhnarishwar and Vishwanath are noteworthy. The distance between Kedarnath and Guptkashi is approx 49 kms which is a beautiful trek route. Winter home of the deity of the Kedarnath Temple and the seat of the Rawal of Kedarnath. Famous for the temple dedicated to sage Agastya. The Chandrashila peak provides a rare view of snow-clad peaks. The rhododendron Forests and alpine meadows dominate the trek from Tungnath to Chandrashila. Sari village is the last bus terminus on Chopta-Ukhimath road from where a 2 kms. trek leads to Deoria Tal. This beautiful lake at an altitude of 2,438 mts. gives the spectacular reflection of snow capped peaks in the lake water. Ideal spot for angling and bird watching. There are daily flight service from Jolly Grant, Dehradun (251 kms) to make your Kedarnath tour as easy as possible. Infact during the Yatra, Kedarnath tourism also offer the helicopter service to Kedarnath temple for the pilgrims visiting the shrine. Approachable on foot from Gaurikund, which is connected by road to Rishikesh, Kotwar, Dehradun, Haridwar and other important hill stations of Garhwal and Kumaon region. During the winters, the shrine is submerged in snow and hence is closed. The ideal time to visit is between May to October. Kedarnath is reached through a 14 km. Long trek from Gaurikund. One more thing to remember, clicking the Kedarnath photos are also not allowed. Although you can capture the beauty around the mandir in your camera.